The main town in Istria is Pula, located towards the south of the peninsula. 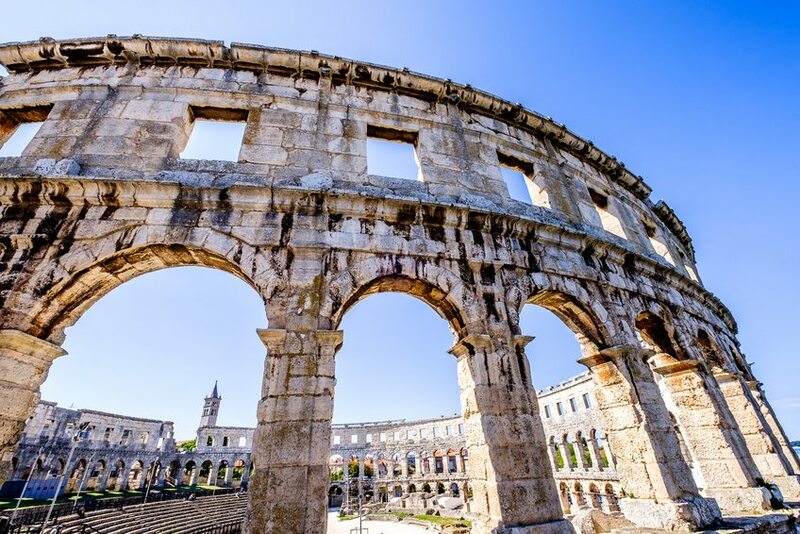 The town is best known for its amazing Roman amphitheatre – called the Arena – which was built in the 1st century AD. Accommodation in Pula comprises of a mix of hotels in the centre and larger resort hotels in an area called Verudela. There is also a very good selection of hostels and private rooms and apartments in Pula, so there’s clearly something for all budgets! Pula has its own airport – see our Flights to Croatia page for details of flights from the UK to there. It is also possible to fly to Italy (Trieste or Venice) and then transfer across from there – see our Travelling from Italy section for more details. Use the box below to search for accommodation in Pula, or read on for listing of hotels and private accommodation in the town. Click through the following tabs to search for the different types of hotels in Pula.